Batch ovens, which allow for the baking of large quantities of food, are often the solution food service professionals will choose when addressing that challenge. Conveyor ovens, which heat products that are passed on a conveyor through a heating chamber, are useful in large-scale baking operations. Other industries with no connection to the food service industry make use of ovens on a scale large enough to merit the use of industrial baking ovens. Art studios and university art programs make use of kilns, which are ovens used to harden sculpted clay projects. Producing ovens that meet the needs of large-scale baking operations has presented oven manufacturers with some challenges. 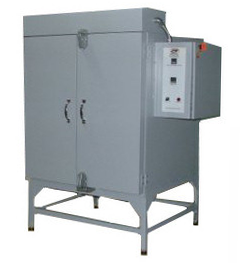 Conventional natural convection ovens, which heat the air in the confined space of the oven by means of either electric coils or burning natural gas, are often suitable for small-scale baking projects; they are most popular as a solution for consumer baking needs. However, natural convection ovens are often insufficient even for large baking projects in a consumer context. The air circulation within a natural convection oven is very minimal, so if, for example, three sheets of baking materials are placed above each other, and the radiating coils are above or beneath them, the middle sheet will bake more slowly. On an industrial or commercial scale, this deficiency could cripple productivity or result in damaged products. In response to this challenge and others like it, products like forced convection ovens, which use a fan to circulate hot air evenly throughout the oven, have made the process of baking on a substantial scale easier. Infrared ovens also offer improved baking evenness and efficiency by transferring heat directly to the product. Baking Ovens The food supply industry makes use of large-scale, industrial baking ovens; some packaged food producers, for example, provide pre-baked or otherwise pre-cooked foods for consumer purchase. Both industries face the challenge of finding ovens of sufficient size, energy-efficiency and means of heat generation when making purchasing decisions.